This is the first book I’ve read in this new spinoff, and I know I’m approaching them out of order. I’m thoroughly enjoyed the colorful, talented, and resourceful Talba, who we first met in the Skip Langdon series. In this book Talba and her boss Eddie investigate a very perplexing double murder that kept me guessing to the end. The only thing that bothered me was the profusion of characters whose names start with A: Audrey, Allyson, Austin, Angie, and Arnelle. I had to think a little harder to keep them all straight. Fun read but a convoluted plot.I enjoyed the characters and it had an interesting feel to it. While there were moments of humor, I'm not sure I'd call it humorous. As I said in the plot and motivation were more convoluted than I liked. Again just an outstanding read. The plot was satisfyingly complex, and her writing style is pretty easy to get into--not too flowery, not overly cliche-ridden. I like Talba Wallis, and in many ways she seems a convincing character. I want to give Smith, a white woman, some credit for trying hard to write a three-dimensional, realistic African American character. On the other hand, two things bothered me: 1) Talba's sister is a walking, talking stereotype of a lower-class black woman. Ugh. 2) We get descriptions of Talba's wardrobe. We get physical descriptions of almost all the other major characters in the book, including her (black) boyfriend and his short hair. But we never read a thing about what she looks like, aside from her clothes. And this includes her hair. No mention of her looking at herself in the mirror to check her hair. No mention of hair appts or haircuts or whether she wears dreds, braids, a natural, a chemically straightened hairdo, or what. Come on, Ms. Smith, you're ducking the issue--and it's a big one. I'm not sure where to start. It's a detective series which breaks my habit of reading tons and tons of fantasy series. Obviously it was, once again, the New Orleans theme that caught my interest. I read the first book and I was sold. An old yearning for mystery awoken and I couldn't get enough. In no time I've finished the entire four book series, which will hopefully be continued on. Talba, better known as the Baroness de Pontalba or "your grace", is this spirited character that seems to be this unstoppable force of nature and nothing can stop her from doing what she wants, or what she feels like she needs to do. The intricate cases she stumbles upon as a P.I. show what a criminal mastermind the authoress Julie Smith is. It doesn't surprise me at all that she is an award winning authoress. Anyone who is looking for an exciting, thrilling book series to read should give Talba a try. I'm sure you're going to love it! Couldn't finish this book.I like to give a new author the benefit of a doubt, and give their books a fair chance. This book however was so poor that I was not willing to invest another moment reading it. This book stereotypes women and black people and pretty much everything southern in such a way that it is shameful. I kept thinking that I would find something behind the prejudicial cast of characters, but I just ended up being more and more offended. In one review I read someone compare this character with Stephanie Plum. Really? That series is actually humorous, this is simply insulting. I haven't read this author before, but there is no way based on this book, that I would recommend her ever. There were some interesting portions of this plot and the characters were somewhat interesting but it left me wanting more. First, the attempt at dialect was annoying and did not, to me, relect any of the dialects I've ever heard in New Orleans. I'm sure it's not easy to convey the colorful language of the native New Orleans resident, but this attempt fell really, really short. The characters sounded more like residents of New Jersey than "Narlens". And the book description referred to it as a humorous mystery. I found it more annoying than humorous and it seemed to drag on forever. Also, I didn't get the purpsoe of the two references to Skip Langdon, the protagonist of another series from this author. They had no relevance to this plot?? I love to read and have the book that I'm reading make my brain work, what better to do that with is a 'Who dunit' story. This book by Julie Smith certainly did come through on the thinking part. I was all over the place trying to figure out who could have possibly done it. Julie has a beautiful writing style and for sure a way with words. Her twists and turns in this story kept me going to the last chapter. Fully developed story line with a cast of outrageous characters that you just have to fall in love with. Everyone of them will have you either pulling for them or cursing them. Great story and our heroine is so adorable, you want her to be real life and meet her. I'm ready for another one of her books with this out of this world Poet PI! Highly recommended. 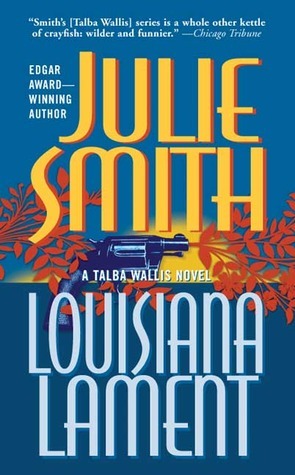 Another kindle unlimited findWhile browsing unlimited selections, I came across Louisiana Hotshot by Julie Smith. I decided to give it a go. I enjoyed it and just completed this, the third in a series of four. I have gotten wrapped up in the mysteries, but in my opinion, character is the biggest appeal here. I really like both Talba and Eddie, and the story on her given name was one that I could envision and broke my heart. The good news for me is that Ms. Smith has quite a catalog of books she has written. I like her style and fully expect them all to be as entertaining as her Talba Wallis series. When I started reading this book I tried to figure out whether I'd encountered New Orleans PI Talba Wallis before. This is the third book in her series -- and she mentions knowing Skip Langdon from Smith's most well-known series -- but I would like to think, at least, that I'd have remembered reading about someone as unique as Talba Wallis. PI by day, Baroness and poet by night, Wallis is a fascinating character that I'm eager to read more about. I already have the 4th book on my Kindle but I'll probably try to find her first two books before reading it, just to be sure I'm all caught up. I've loved Smith's writing and characterization for years but I feel like I'm falling in love again. I read this book because I enjoyed the two before it. I like the series because I like the characters, and the setting of New Orleans. This one though, had a less believable plot, and introduced characters that were really unlikeable. The story seemed to drag on for me, unlike the two previous books. I will probably read the next one, because I like the character of Talba Wallace (the P.I.) and her boss, and I'll be looking (and hoping!) for a plot that develops at a better pace. I still think Julie Smith is a good writer, this just isn't her best one. This is the third book in the Talba Wallis mystery series. Talba is a young, African-American, computer-brilliant,beginning PI who is also a noted poet by night. Her boss, Eddie Valentino, is pushing seventy, white, tech-challenged, and pretty much burned out. This book finds Talba's sister calling her because she has discovered a body--things go downhill from there. Lots of twist and turns, along with laugh-out-loud moments. A good read. New Orleans fascinationNew Orleans fascinationThis is the first of Julie Smith's books that I have read and I enjoyed it very much. It had a good plot and I didn't figure out " who done it". There was mystery and mayhem with enough humor to lighten it just when it was needed. I liked the characters - felt involved with them, liked the incongruity of a PI /poet, And enjoyed the poetry too. Will be looking forward to reading more of Ms. Smith's books. Lost in charactersLost in charactersLots of characters, lots of twists and turns,too much "Gatsby" reference to add to confusion. I knew the murderer almost from the beginning but the detectives were too slow. Didn't like the vernacular of the book.Don't think this book is for me however, it might be for anyone else who would like to see more young, black female poet, PI character. It was interesting. A private investigator and poet works in New OrleansI like Talba, the main character. She's smart and she's gutsy. I like the New Orleans location, rich characterization and involved plots. I'm a Southerner and I like that the South is represented fairly as both richly cultured and imperfect. I've not read any other books by Julie Smith, but there were elements here that reminded me of Janet Evanovich (crazy family; interesting boss). The idea of a poetess that is also a PI because that pays the bills is intriguing, as is the use of poems in the book to get information or encapsulate the experience of the investigation. Not readableThis is supposed to be a humorous series! What's hilarious about a mean, foul mouthed caricature who is too stubborn to listen to her attorney? I got through less than a quarter of this mess and could go no further. The book is offensive, boring (maybe it's greatest sin) and not worth a penny. The only reason I finished this book is because I really wanted to know how the author would tie up the loose ends. The attempts to write New Orleans patois was distracting to me and failed miserably, in my opinion. The plot was convoluted and the characters wooden. I don't think I'll be reading anything else by this author. Who did it?This murder mystery kept me wondering for many answers.Many suspects, missing folks, plots, and alibies were in many heads.It is not resolved until the end.It is a New Orleans detective-mystery with many twists playing with cops in the background. It is hard to put the book down before you have finished. I tried to slog through this twice. First, the write up on this and the book I have do not match. Second, I'm black and my family is from the South, so the main character is plausible, but I still think no. Third, not especially well written. A thrill ride through a maze.The sensitivity that is displayed in the characters' personalities is balanced by the twists and turns that keep you guessing and turning pages. Loved it. The Baroness myselfGalba's character continues to develop as the series progresses. I hope Janessa bonds soon with that family as it has dragged on long should. Clever mystery with the requisite twigs. A truly enjoyable read. Funny and entertaining.Read her first 2 books and was interested in her style of writing. Have enjoyed the third one very much and her style of writing is expanding and very enjoyable and relaxing to read. Pur based the fourth one and anxious to read it. Nice absorbing mystery read without being a downer.Ms.Smith has a lovely light writing style and makes you want to keep reading to figure out which one of the total jerks described is the killer. For a supposedly tough, hot shot PI, Talba Wallis sure is naive. The author lays the whole story out for the reader so there is no surprise when "who dun it" is revealed, but it takes the bumbling detectives 300 pages to figure it out. Yawn. Two deaths--mother and daughter, each in their own homes and on the same day. Poet and PI Talba Wallis's barely-known half sister may be the primary murder suspect, but as the story unfolds there are plenty of other suspects in this complex, twisted plot. Couldn't wait for it to endI usually enjoy this author, but this book was complicated and seemingly endless. Too many characters. Weird inter connections. I did finish the book but wonder why. Took longer than it should. I enjoyed the character of the Baroness, but felt the plot was perhaps too convoluted!